Charles Levi Klisser, a native of Amsterdam, Holland and a tailor by trade, was born in 1830 and arrived in South Australia in 1854. He either did not have a permanent address as yet or his letters had not arrived in Amsterdam as the Adelaide Post Office published its list of unclaimed letters in May 1855 which included his name. In 1856 he ran the Hamburg Hotel in Rundle Street, which he put up for sale in October of that year. His next adventure was the start of a hawking business, selling his wares, mainly clothes, in and around Adelaide and in the nearby country. He always advertised before leaving Adelaide where and when he would go. In June 1861 though he had to inform his customers and friends that in consequence of ill-health he had been detained in Adelaide much longer than expected. As he was now improving he would soon start again for the north with a large stock. In March 1862 while returning from Glenelg with his horse and cart he collided with one coming from the opposite direction resulting in the death of his horse and being badly injured himself. By the end of May he was well enough to start for the North and North-East with a large and well-selected stock of fashionable and seasonable drapery goods. His last trips for 1862 were made in August and September. Several trips were made during 1863, the first one in February. The August trip included the latest brand new stock which had arrived on the Sea Star and Orient ships. He also carried a large selection of Colonial made boots. After a busy and what seems to have been a successful year he applied to be Naturalised. This request was granted on 17 November 1863. The following year proved just as busy with several more trips to the country. In November Glen Para Wines appointed Klisser as agent for the sale of their wines. At the start of 1866 he was thinking of selling his hawking business. During February he advertised it as a first class business which had been carried on successfully for some ten years and could be had on easy terms by applying to G and R Wills & Co. He was unsuccessful and in March made it known that he had taken John Johns into Partnership and in May they started from Kapunda on their way north with the largest and best assorted stock they had ever been able to offer. However he was still thinking and planning to open a shop in Adelaide. By August 1866 he had achieved his aim and made it known that he had opened a Tailoring and Clothing Emporium at 74 Rundle Street, next door to JM Wendt. He had also made arrangements to have regular shipments of the latest fashions imported from Europe, the first of which had just arrived making it possible to offer the best goods at the lowest prices. From now on Charles would run the shop whereas John would take care of the hawking business. At the same time he had been arranging a trip to Holland where he married Elizabeth Samuel on 9 April 1867. They soon left for England, where they presumably selected more stock, and from there sailed on 1 May, in the Coonatta, for South Australia and arrived on 26 July 1867. The ship, captained by W Begg, must have been a fairly comfortable home for the young couple who travelled as saloon passengers. After leaving Kangaroo Island, they and the other ten saloon passengers presented the Captain with this address which was later published in the South Australian Register. ‘We have the pleasing duty to record our sincere thanks for your uniform kindness, and attention to our wants during this voyage from London to Adelaide. We can not express too highly our admiration of those seaman like qualities which have under Providence brought us thus far in safety on our journey which promises now a happy and speedy termination. We desire also to mention the name of your First Officer, Mr Wagborn and to express the estimation in which we hold his character and abilities. We are unanimous in agreeing that if about to take another long sea voyage, we could have no Captain, who would inspire us with greater confidence than yourself. In conclusion we beg you to accept this assurance of our esteem and regard and may He, who has watched over you, hitherto continue to preserve you and yours, wherever you may go’. C.L. Klisser, Lizzie Klisser plus ten other names. Coonatta, off Kangaroo Island, July 23, 1867. Charles and Elizabeth had several children but only one, Michael, lived to adulthood. On 27 February 1868, they had a daughter at Kent Town, named Emma Annie. Sadly she died three weeks later on 19 March. A year later, Elizabeth gave birth to a son, Jacob, on 25 July 1869. He lived only three hours. Twelve months after this unhappy occasion they had another son Louis Michael on 21 July 1870 at Ward Street. In January 1872, while still living at Ward Street in North Adelaide, they had a son who was still-born. They were all buried at West Terrace Cemetery, as was Elizabeth who died in 1887 at the age of 47. In June 1869 Charles received a letter from Holland informing them of the death of his mother in Amsterdam, aged 73. His brother in Cape Town died on 27 July 1883. Elizabeth’s mother died in May 1875, aged 58. 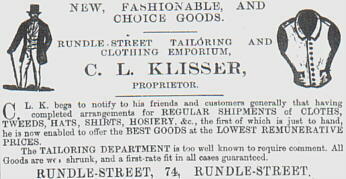 As early as January 1868 Klisser advertised his shop in the local papers. A few months later he announced that he most respectfully thanked his numerous friends for the very liberal patronage bestowed upon him since his commencement of business. He also assured them that no effort would be waning on his part to merit a continuance of that support. He regularly promoted his shop and skills in the nearby country newspapers. Business was good and in September he appointed Thomas Hopwood of Melbourne as cutter and manager of the Tailoring Department. Being well-established he now planned to expand and added other lines, such as portmanteaus of all sizes, umbrellas and walking sticks, just the items a gentleman needed. To attract even more customers to his shop he held an art exhibition displaying some beautiful framed pictures made in Berlin wool and engravings which included a number of scenes from the Scriptures. All imported from Holland. Klisser also showed that he was willing to be instrumental in the local community and became involved with the South Australian Swimming Club as a judge, even donating some of the prizes. When on 24 March 1869 the anniversary of the birth of Queen Victoria was held at Government House he was one of those who attended, as were Charles Todd, JB Hack and CC Kingston. When money was needed for good causes Klisser could be relied on to make a donation. Among some of the beneficiaries were the Adelaide Hospital, the Blind, Deaf and Dumb Asylum, the Norwood and Kensington Institute and the Troubridge Relief Fund. During these busy days he was still able to keep up a regular correspondence with his brother ML Klisser, who had migrated to South Africa and spoke highly of the gold and diamond discoveries there. Furthermore he was involved with the Jewish community. In 1869 he was, and remained, a Committee Member of the Hebrew Congregation, which had its Synagogue in Rundle Street, until 1877. From 1872 until 1883 he was a committee member of the Adelaide Hebrew Philanthropic Society and in 1876 was also on the Board of Management of the Adelaide Jewish Sabbath School. During 1870 he supported Judah Moses Solomon for his nomination as Mayor of Adelaide and JB Neales in his bid for a seat in the Legislative Council. Both were successful. In December 1869 the Klisser family was told that their house on part of Town Acre 772 at Ward Street would be put up for auction. They arranged a substantial mortgage and bought it from the present owner and continued living in it until 1883, while the shop at 74 Rundle Street was rented. As the partnership between Klisser and Johns was dissolved in April 1870, Charles, a draper by trade, was often away from home operating the hawking business. He notified his numerous friends and customers that it was his intention to relinquish this business at once and sold his heavy draft horses. The hawker’s van, well fitted and in good order, was sold in January 1872. Later that year he became a member of the Commercial Travellers Association of South Australia. He must have changed his mind again at some stage as very soon afterwards he said, ‘Finding it imperatively necessary, in consequence of the great increase of trade in the tailoring department during the last few months, there are two alternatives. Either enlarge the premises or relinquish the English Ready Made Clothing department’. He decided on the latter course of action and would devote himself solely to the tailoring and manufacturing department. While living at Ward Street, one of Klisser’s neighbours was Richard A Fiveash, Superintendent of the Yudanamutana mine in the far northern Flinders Ranges. As Klisser’s brother in South Africa was talking about mining in his letters it is no wonder that Klisser also became interested in copper mining and joined numerous other hopeful prospectors and investors to strike it lucky. He must have visited the Flinders Ranges at some stage as in June 1872 he reported an earthquake at Mount Bryan. On 19 September 1872 he applied for three mineral claims, 4400, 4401 and 4402 near Sliding Rock. All three were for eighty acre sections. When new elections were held in 1873 for the Legislative Council, Klisser supported the nomination of RA Tarlton who was also backed by Thomas Elder, William Kyffin Thomas, JM Wendt and George Scarfe. Tarlton was in favour of compulsory secular education for children and the building of the Adelaide-Darwin railway. In September MJ Solomon was leaving for the Northern Territory and was presented with suitable gifts by Klisser on behalf of the Hebrew Congregation, in which Klisser was very active. Unable to go to the Northern Territory himself and see all the gold, Klisser became a shareholder in the Princess Louise Gold Mining Company in January 1874. Like many other South Australians he got his fingers badly burnt, which resulted in some financial problems. To solve them he tried to expand his tailoring business and advertised for a youth for the shop. In April he wanted Tailors and a Tailoress. In May he needed four first class coat hands whom he offered constant employment. By the end of 1874 he wanted additional first class tailoresses and a smart youth, to be paid according to ability. The next year proved to be just as hectic. He had secured the contract to supply the Police Department with clothing. In April 1875 he took John Walsh, one of his employees, to court for leaving his employment without lawful excuse. John was fined £4. He was not the first one either that he had taken to court. The previous year it had been Simon Sheehan, a journeyman tailor, who had unlawfully retained two yards of cloth and trimmings valued at £1.15. In May 1878 John Manion was charged for absenting himself from work without leave or lawful excuse. A few weeks later Walter Munro was charged £2 for not turning up for work. Klisser was still in need of personnel, especially Tailoresses. Was he that busy or was it because their wages were much lower? In November 1875 he needed two first class Vest Hands and was willing to pay the highest wages. In 1876 he wanted a white shirt maker and a year later a first class Presser. During 1875 Klisser became involved in a movement to form some sort of trade union for Master Tailors. It eventually resulted in the Master Tailors’ Association which had its dinner on 5 October 1875 with Klisser as Vice Chairman. He still found time to attend the Free Mason dinner at the Town Hall in July and being on the Committee for the Sir Moses Montifiore Testimonial Fund and join the proposers of Caleb Peacock for Major of Adelaide. 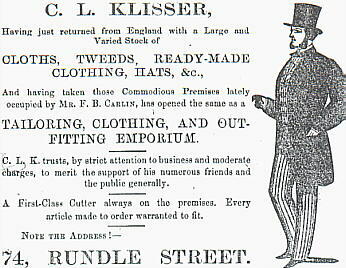 For most of 1877 Klisser ran advertisements in the different papers for more staff. In 1878 he was again advertising his business and telling all his old and new customers that he had engaged the services of a first class shirtmaker. It seems that he also became the owner of a hotel which became known as Klisser’s Hotel with H Hammond as publican. When Hammond left for Kadina he was given a complementary dinner. In January 1879 Klisser, DGS travelled to Mount Barker to attend a Free Mason’s meeting. In March he had visited Port Augusta In June he was back in Port Augusta attending a Rifle Club meeting and donated a silver cup for the highest aggregate scorer for 1879. In August 1879 he advertised in the northern newspapers that he would visit Port Augusta with a choice and well assorted stock of Tweeds and Woollens suitable for the coming season. During November he was on a committee for the election of ET Smith for Major of Adelaide and in December the newspapers mentioned how nicely his shop was decorated for the Christmas festivities. 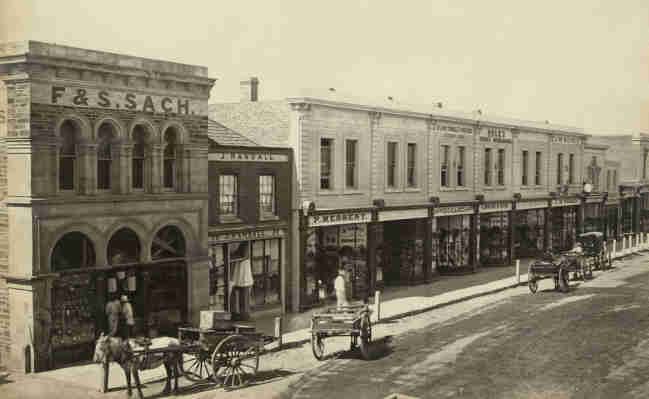 Charles Klisser remained in Rundle Street up to 1880. From then on things went wrong somehow. In May he went to Melbourne by the steamer Penola. But on 15 July 1880 Klisser 'conveyed and assigned his estate and effects to Walter Howard, merchant, as trustee for the benefit of his creditors. Had he over reached, too many creditors, competition, staff problems, non-paying customers? Staff was dismissed, obviously, but H Hamer, principal cutter and manager of the Tailoring department had started up his own business at Stephens Place next to the Globe Hotel. WM Jones of Norwood wanted a position somewhere and was only too happy to state that he had previously been employed by Charles Klisser. In August his property in Ward Street was up for sale and listed as valuable freehold with a substantial house, subject to a mortgage of £500. Possession one month from the date of sale. His shop in Rundle Street was also available but this was under lease hold. His stock was bought by Charles Birks of 38-42 Rundle Street. On 9 September 1880 Klisser was able to pay his creditors forty per cent of the total amount of money owed to them. He made regular payments to his creditors. On 18 November 1880 he paid his creditors another twenty per cent, on 26 May 1881 a further ten per cent and during 1883 a final twenty percent. He tried hard to set up another business and find a new home for his family. He moved to the north and by the end of the year we find him living at Beltana, in the northern Flinders Ranges, being a storekeeper from 1881 until 1883. The storekeepers licence had been transferred from A Wyly & Co during December 1880. In 1882 he also became an agent for the Luxmoore Company, wool buyers of Adelaide and Port Adelaide. During these years he was also the Registrar for Birth, Death and Marriages and Clerk of the Local Court. When the railway reached Beltana in 1881 Klisser was on the welcoming committee and gave a speech inviting Mrs Blood to open the new section. A ball was held that night at Mr Hantke’s assembly hall. During his time at Beltana he was described as ‘the former prince of Adelaide’. In April 1882 Felix Buttfield, one of his employees was charged with sly grog selling on the Government Gums railway line and fined £10 plus cost for each offence. His son had remained in Adelaide boarding at Whinham College, Ward Street, where he did well and even won some prizes for his History and Geography subjects. His wife lived at Margaret Street and was a committee member of the Adelaide Hebrew Ladies Benevolent Society. Most likely the Beltana period had not been an overly successful enterprise as in February 1883 he sold out at Beltana and once again opened a shop, this time at 105 Rundle Street while living at Archer Street, North Adelaide. When back in Adelaide he was keen to attend the meetings of the Adelaide Chess Club of which he had been a member, player and committee member for many years. He had often donated prizes for this club and the Swimming club. He soon advertised that he had much pleasure in informing his old customers and the general public that he had again commenced business as a tailor and outfitter. He had now also engaged the services of Herr Finke, who had recently arrived from Berlin, and had brought with him the latest improvements in tailoring, as cutter and fitter. Tailoresses, trousers and vest hands were also offered constant employment. Strangely though, he still did a fair amount of country travelling. In June 1884 he was at Morgan and nearly drowned when he fell into the River Murray while boarding the steamer Ruby. A few months later he was at Terowie on Free Mason business. 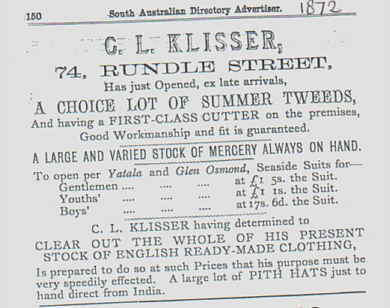 There is no mention of his shop at 105 Rundle Street but in March 1886 Klisser was appointed manager of the Furniture Import Company in Hindley Street. On 25 January 1887, his wife Elizabeth died at Childers Street aged only forty-seven. She was buried at the Jewish section of the West Terrace Cemetery. Klisser, always the gentleman, thanked everyone for their kind letters, telegrams and visits of condolence in his late bereavement. The Adelaide Hebrew Ladies’ Benevolent Society wrote that it had sustained a severe loss as Mrs Klisser had always evinced a deep interest in our poor, not only during her term of office as treasurer but also long afterwards. This latest setback was the straw that broke the camel’s back. Klisser had enough and decided to sell everything, including all his household furniture, by auction without a reserve and move to Victoria where he arrived on 5 April 1887. He soon joined the Melbourne Chess Club. Klisser became a well-respected man and was once again active in the Jewish community. He was always esteemed as a man of very honourable principles and very genial disposition. He died at Dolville, Fitzroy Street, St Kilda on 17 August 1898 aged 68 years. His clothes were to be distributed amongst deserving poor Jews in need of it.